Banco Central do Brasil launch, in January 2014, a series of Official Brazilian commemorative coins of the 2014 FIFA World Cup BrazilTM. There will be nine special coins, aimed at collecting: one gold, two silver and six copper-nickel coins. 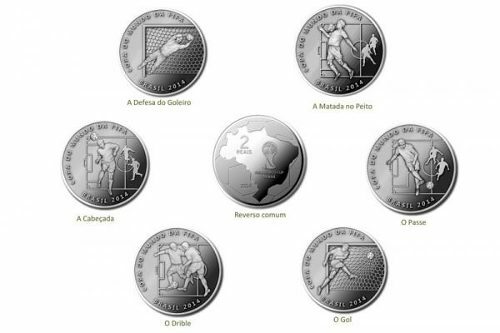 The copper-nickel coins will form the Commemorative Series "Football Moves", depicting typical bids of the game: "saving the ball", "heading the ball", "controlling the ball in the chest", "passing the ball", "dribbling" and "scoring"